The Indigo TIM is an Engineered Thermal Interface (ETI) that fits neatly between a CPU lid and heat sink (or waterblock) to keep CPUs cooler. Unlike greases, metallic thermal interface pads or liquid metal alloys, Indigo is a self-contained and sealed structure, deploying a Phase Change Metallic Alloy (PCMA) which reflows and fills surface asperities on the CPU lid and heat sink. The resultant interfacial layer is void-free and robust, with low thermal contact and bulk resistance. The overall thermal performance of a thermal interface is the sum of the bulk thermal resistance (which is the inverse of bulk thermal conductance) of the material and its two surface contact resistances (on both the CPU lid and heat sink). Greases have good surface wetting properties and therefore they exhibit low contact resistance; however, they have high bulk thermal resistances. Metallic pads possess low bulk thermal resistances, but surface oxidation limits their surface wetting ability, resulting in higher contact resistance. Indigo achieves high thermal performance through the optimized deployment of molten, oxide-free PCMA, thereby yielding low contact resistance and low bulk resistance. The revolutionary Indigo "flow-in-place" technology deploys, controls and contains the phase change metal alloy during reflow to create an optimized, void-free thermal interface that is unsurpassed in performance and reliability. At the heart of the one-of-a-kind Indigo ETI is a proven PCMA deployment structure. When heated (see Installation Guide), the sealed deployment structure directs flowing PCMA into CPU lid and heat sink micro-surface asperities while flushing out entrapped air. The asperity filling PCMA creates a corrosion-resistant hermetic (airtight) seal between the lid and heat sink, resulting in long-term reliability. 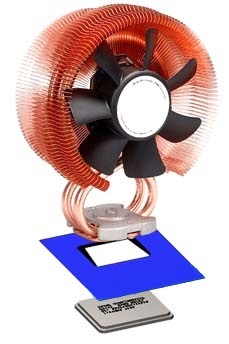 High performance thermal management solutions (heat pipes, liquid cooling, etc) can be limited by the thermal interface material. The Indigo TIM is the first engineered thermal interface that delivers a void-free, all metal thermal pathway at the critical junction between the processor lid and the primary thermal management hardware.